Oil prices continue to affect these offshore drillers' prospects and stock prices, but the prospects look very good for all three when the cycle turns. In June, shares of offshore-drilling contractors ENSCO PLC (NYSE:ESV), Atwood Oceanics, Inc. (NYSE:ATW), and Transocean PLC (NYSE:RIG) fell sharply. Shares of Transocean were down more than 13% at one point before recovering a small amount, and finished June down almost 9.5%. 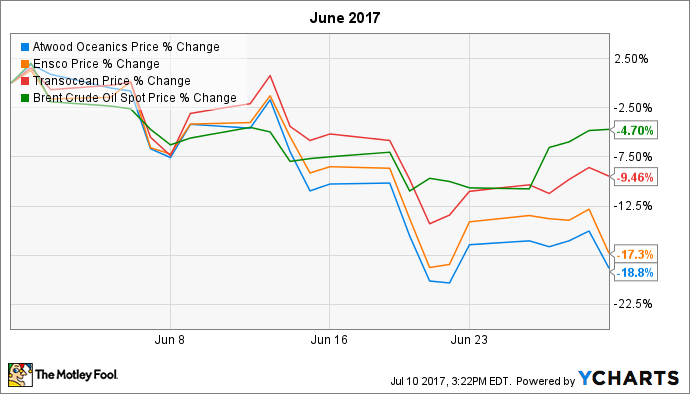 Both Atwood Oceanics and ENSCO finished June with their stocks down more than 17%. This is a continuation of an ugly year for investors in any of these three companies -- or really, any other offshore driller. Since the beginning of the year, Atwood shares are down 40%, while Transocean and ENSCO shares are down 45% and 48%, respectively, as of this writing. In short, it's another case of crude-oil prices driving the market for nearly every company that's exposed to oil prices. This is particularly true when there's not any material news to otherwise drive investors' actions -- which was the case in June with all three of these companies. As you can see, oil prices have become the "tail that wags the dog" when it comes to offshore drillers. With crude prices falling as much as 11% at one point during June, it's not unexpected that their stocks would follow oil prices down without any major material news. In the short term, oil prices are almost certainly going to remain the biggest driver behind offshore-drilling stocks. This is likely to be especially true for the remainder of 2017, with capital-spending budgets for offshore exploration and drilling already on track to be the lowest in years. However, there's a good chance that the downturn could bottom in 2017, and spending is already showing some signs of improving next year. There's been increased bid activity already this year, but nearly all of the work being offered won't begin until 2018, or later. But with that said, much of the new contracted work announced this year are extensions of existing agreements, or contracts for vessels already working. In other words, there still remains a dearth of new work for the many vessels either already idle, or with contracts set to expire in the next year, and no work lined up to replace existing contracts. All three of these companies should be able to ride out the downturn and be key players when the cycle turns back to growth -- which is good for investors. To start, ENSCO and Atwood are moving closer to closing an all-stock deal for the former to acquire the smaller Atwood. This deal combines ENSCO, a company that's taking market share from other drillers, with Atwood's high-spec, new fleet of vessels. This move positions ENSCO to be ultra-competitive when producers start spending offshore again. For Transocean, the future could be similarly bright. The company's big debt load creates some risk, but management has done a solid job improving the balance sheet in recent years. At last report, the company had over $3 billion in cash -- which nearly doubled in the past year -- and $8.4 billion in debt, which is down 19% in three years. Also, the company has scrapped dozens of its oldest and unviable vessels, and recently reached a deal to sell off its jack-up rig fleet for $1.35 billion -- two major moves to lower expenses -- and positions the company to focus on the future offshore in deepwater and harsh environments. Factor in a massive $10-plus billion contracted backlog, and few offshore drillers are as well positioned to ride out the downturn as Transocean is. Add it together, and the combined ENSCO/Atwood and the leaner, stronger Transocean are positioned to be major players when the cycle turns. It may take another year before the cycle truly does turn, but patient investors willing to keep riding it out could do very well owning these drillers when the recovery happens.